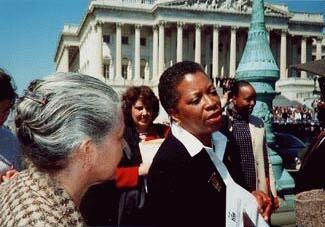 On Thursday, April 5, 2001, Deborah attended three events concerning health care. The first was a press conference announcing the introduction of HR 1142 by U.S. Representative John Conyers, which would extend Medicaid coverage to most of America's uninsured. 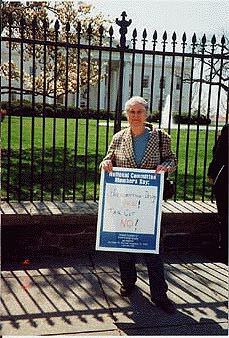 There followed a demonstration at the White House, where Deborah marched with members of the Gray Panthers and others to protest the cuts in Medicare that would be caused by President Bush's proposed massive tax cuts for the rich, and also to call for adding prescription drugs to Medicare coverage. 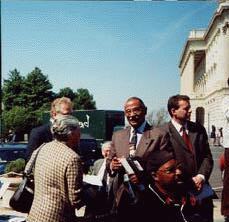 Later that day, Deborah attended a press conference held by Senator Debbie Stabanow and others on Capitol Hill on the same subject. The photos below were taken by George W. Lowy at the first two events.